Relax and smile! Finally, the new revolutionary way to correct your vision is available in Quebec. Once again, Invisia is at the forefront as the only clinic in Quebec to offer this unique technique. 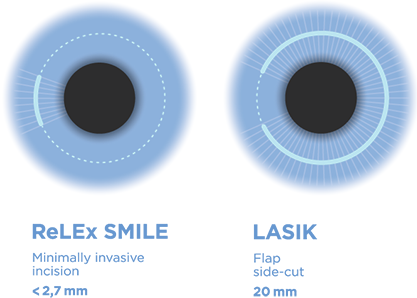 We are proud to introduce the latest generation of laser vision correction for myopia and astigmatism: the ReLEx SMILE. We create in the cornea a mini lens (lenticule) of optical correction, which is then gently removed by an incision of less than 2.7 mm. This technique, less invasive, includes several advantages unlike the PRK and LASIK. Opening of less than 2.7 mm. 80 % less peripheral cut compared to LASIK. Preserves the nerves of the cornea. Preserves the biomecanic and stability of the cornea. Reduction of postoperative discomfort (1h – 3h) compared to LASIK (4h – 6h) and PRK (1 week). Only 28 seconds to create a lenticule of any correction. Transparent curved plastic interface which adjusts to the natural shape of the cornea to prevent unnecessary compression on the cornea. No loss of vision during treatment or important pressure on the eye.